BNP will stage demonstrations across the country on Tuesday, protesting the conviction of their party’s chairperson Khaleda Zia in Zia charitable graft case. 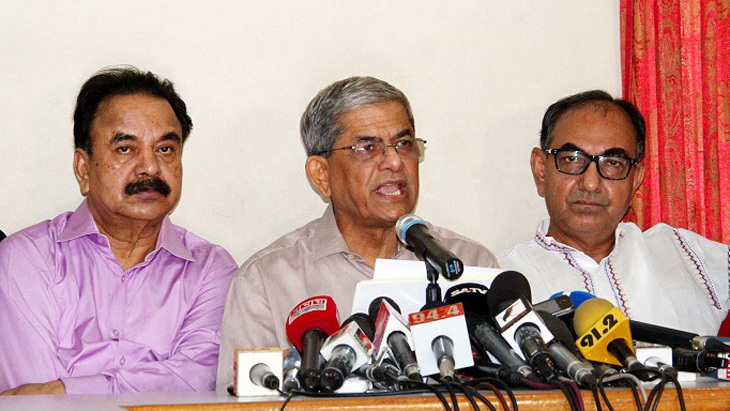 BNP secretary general Mirza Fakhrul Islam Alamgir announced the programme at a press conference at BNP's Nayapaltan central office here on Monday. He said the programme will be observed in all metropolitan cities and district towns. Fakhrul called upon the leaders and activists of BNP and Jatiya Oikyafront to make their programme a success with their spontaneous participation. The BNP leader said Khaleda Zia has been ‘illegally ‘convicted in the Zia charitable trust case at the 'behest of the government' to keep her away from politics and the next general election. He also said Khaleda was denied justice in the case. Meanwhile, a group of BNP leaders and activists brought out a procession in front of the BNP office, protesting the verdict that convicted Khaleda in the case . A Dhaka court sentenced BNP Chairperson Khaleda Zia and three others to seven years’ rigorous imprisonment each in the much-talked-about Zia Charitable Trust corruption case.